The Search and Rescue Transponder (SART) is a self-contained, waterproof, floating radar transponder intended for emergency use at sea. They are designed to be used on board any vessel; ship, boat, or survival craft. There are (2) types of Search and Rescue Transponders, the “Radar SART” and the “AIS SART.” We will be discussing the Radar SART since it is the most common found on board smaller as well as non-commercial vessels. The primary use of the SART is to allow rescue vessels or aircraft equipped with X-band radar (common marine navigational radar,) to home in on the exact position of the SART by enhancing the radar return so that it is clearly visible on the radar of any vessel including search and rescue vessels. Lithium battery-powered with a shelf life of 5 years. Provide a minimum of 96 hours usage in standby mode, and more than 8 hours when actively transmitting. (1) On vessels between 300 and 500 GRT. (2) On vessels of over 500 GRT. (1) For Roll On/Roll Off passenger vessels, per every four life rafts. And in some cases ANY vessel that carries more than (1) life raft. While most recreational vessels are not required by law to carry a SART, the offshore fisherman, long distance cruiser, and bluewater passagemaker might want to give some thought to adding one to their safety equipment inventory. The Radar SART, How it Works. 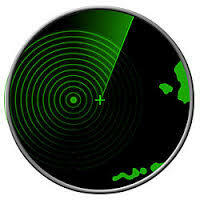 Without getting into a long drawn out explanation of how radar works, lets simply say marine navigation radar simply transmits very short radio waves from its antenna and using the time required for a reflection to return and the direction of the radar antenna at that moment, it can determine the range and bearing of the object that caused the reflection and display that information on the radar screen. The Search and Rescue Transponder operates much like the familiar Radar Beacon (RACON) found on many aids to navigation. 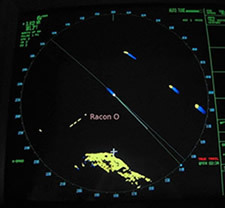 When swept by a pulse from a vessel’s radar, the RACON will transmit a series of dots and dashes (Morse code) and these will be displayed on the vessels radar screen. This enables the navigator to easily identify a particular ATON. (See illustration right.) This RACON is showing (3) dashes which is Morse code for the letter "O." The SART on the other hand, paints (12) unmistakable bright dots on the radar screen when a vessel gets within range. 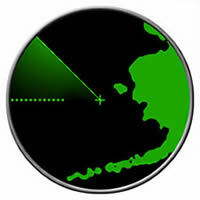 The closest dot to your vessel indicates the actual SART’s location. The Search and Rescue Transponder incorporates both a radio receiver and a transmitter tuned to the frequency of marine navigation radar. When the SART is interrogated (swept) by a radar beam the SART receiver picks up that signal and responds by generating and transmitting (12) amplified signals with only micro seconds delay between each. 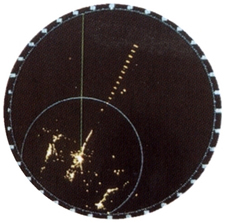 This results in the characteristic (12) dots displayed on the radar screen (see illustration left.) It does this any and every time when swept by a radar. When a Search and Rescue Transponder is turned on, it goes into what is known as the “Standby Mode.” This means that the SART is operational and waiting to be interrogated by a radar. When it detects a radar pulse, it automatically switches into the “Active Mode” where it generates an amplified signal and transmits (12) pulses back to the interrogating radar. At distances greater than (1) NM, the radar screen will display the SART transmissions in the familiar (12) dot configuration. 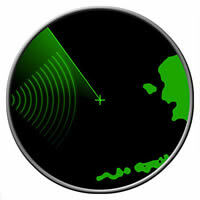 If no radar pulse is detected for a period of approximately 15 seconds, the SART automatically returns to the standby mode to await further interrogation. Most SART models are also equipped with a light and buzzer that will activate when interrogated alerting you that it has picked up a radar pulse and is responding. As the distance to the SART closes to within approximately (1) NM, the (12) dot display will start to become concentric arcs centered on the SART. The length of these arcs will gradually increase as the distance closes. These arcs will gradually become full concentric circles surrounding the location of the SART, indicating that you have arrived at the SART's location. Because of the frequency used by the SART, (9.2 to 9.5 GHz) known as SHF or Super High Frequency, the Search and Rescue Transponder is considered to be a line of sight device much like the VHF radio. The antennas must be able to “see” each other to operate effectively. This means that the higher you are able to mount the SART when in use, correspondingly increases the effective range. A SART mounted 1 meter or 3.3’ above the surface has a radio horizon of only slightly more than 2.1 NM. Luckily most vessels radars are typically mounted at or above 10’ from the surface. This means that the effective detection range will increase to slightly less than 6 NM. When you factor in larger vessels and ships with radars mounted at 75’ or greater above the surface, initial detection may be out as much as 12 NM’s. Search aircraft flying at altitude, may likely detect the SART signal out to a range of 30+ NM’s. The moral of this story; the higher that you can mount the SART above the surface the greater range that it will be detected at. An EPIRB or a Search and Rescue Transponder? 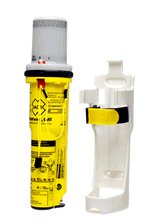 Remember, a SART is not an alternative to an EPIRB, they are designed to fulfill two completely different functions. All things being equal, the ideal situation of course is to have both. If you are just beginning the fitting out of your boat, the question may arise whether the purchase of an EPIRB or a SART is in your best interest. In this case, the purchase of a 406 MHz EPIRB will provide you with far more capability in the event of an emergency. Providing SAR teams not only with position accuracy often times within a few meters, but with additional information such as the vessel name, vessel characteristics, the vessel owner, and emergency contact numbers. With both the EPIRB and SART being in the same general price range, the decision to add a Search and Rescue Transponder to your onboard safety equipment is often a matter of budgetary constraints. Remember that the SART provides capabilities that the EPIRB doesn’t. Specifically the capability of being easily located, even in the poorest of visibility, by any vessel equipped with standard marine radar that is within range.